This post, like the previous one will be going up a bit late. While I would normally do it all each night, time and the need for some sleep is getting the better of me. Plus these posts are going to be pretty much all Disney (with an exception here). Today started pretty early, with us planning on getting to California Adventures again nice and early. But I tell ya, it was a struggle this morning. We are slowly catching up on sleep but given we have been pushing it each day, so 7 hours or so a night isn’t really cutting it at the moment. Oh well, what can you do. We got there on 9am, and the plan first thing was to get fastpasses to Radiator Springs Racers. Well, best laid plans. The queue just for fastpasses was almost an hour itself! “Forget that” we both said and checked out what to do next. 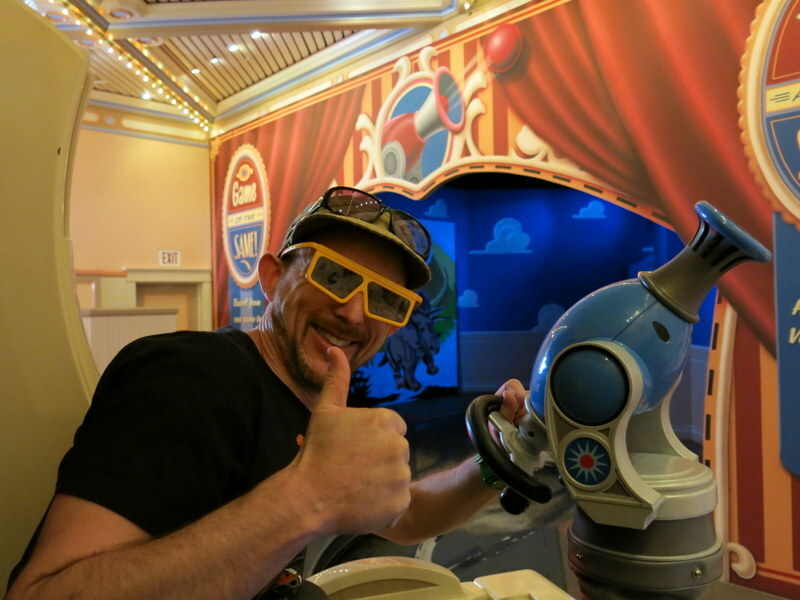 … Toy Story Mania being the main one. We missed this the previous day given it had no fast pass and the wait was usually a while. But today we settled into the queue to get some action. The wait was not too long by some standards, and when we got in we went crazy. Like Buzz Lightyear Astro Blasters, this was a carriage ride of shooting at targets, but even better. Matt gives this ride the thumbs up! … and so does Kate! 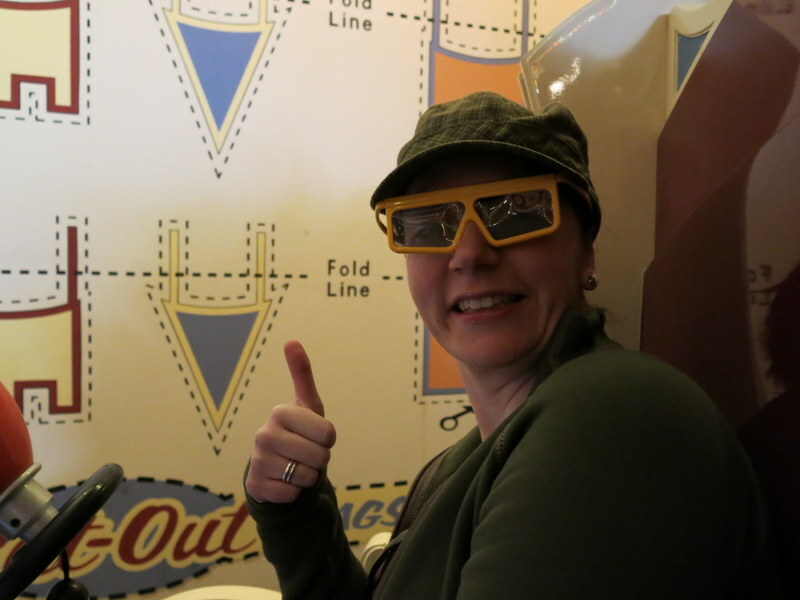 Wearing 3D glasses, it played out like a carnival tent, going from game to game, furiously pulling our cords to fire our guns at the targets in each mini-game. Holy cow it was great fun! By the end we were exhausted from getting into it so much, and were without a doubt we would be back. A visit back to A Bugs Life was in order to go on some of the remaining small rides. 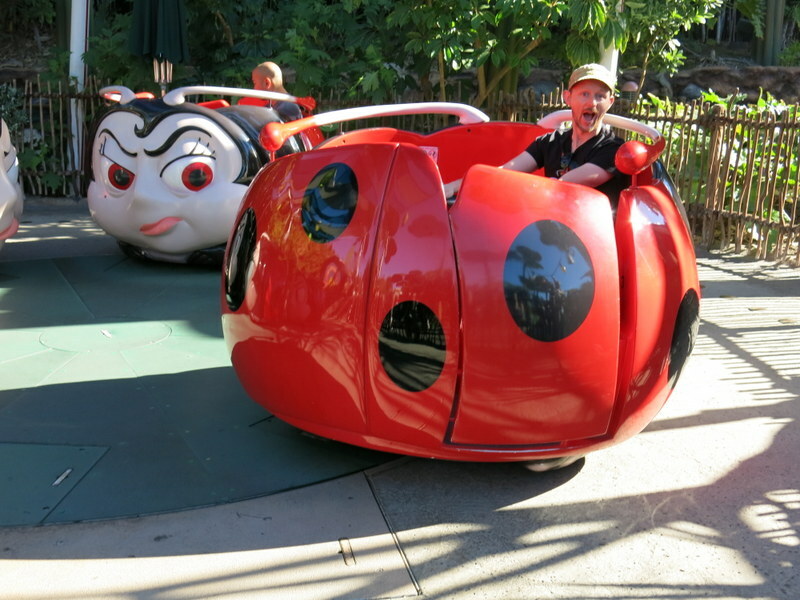 One was a bit teacups-esque, spinning around in a lady beetle. With Kate’s aversion to all things spinny, I went solo again. Fun, but probably much more fun if I was 6. The Tower of Terror on the other hand demanded another go, and with no queue in I ran. Ah, there is nothing like being on a ride where your stomach spends considerable time in your throat. It was only a bit after lunch so we decided to head back into Disneyland. This was the beauty of the park hopper pass, and the parks being literally 30 seconds walk from each other. 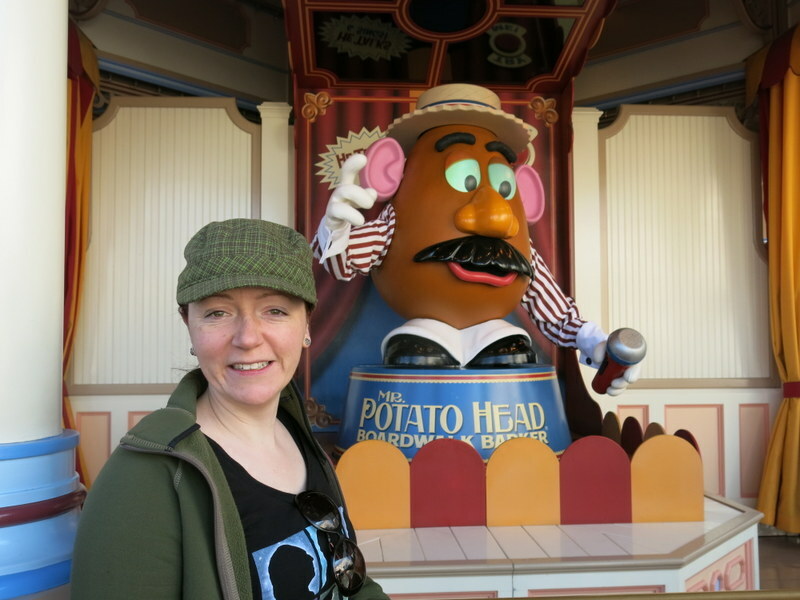 We had a bunch more to do in Disneyland, so in we ran to knock off some more rides! 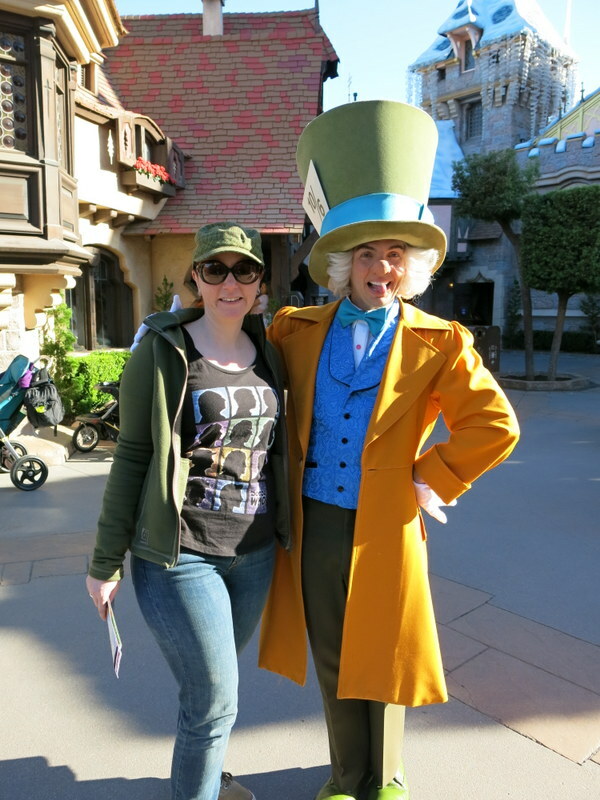 Without going into all the details, we ran around like loons… judging line sizes and chasing characters. We did Pirates of the Caribbean, where the old-school feel of the ride was only changed by the occasional presence of a suspiciously Johnny Depp looking pirate. Splash Mountain was then in order. 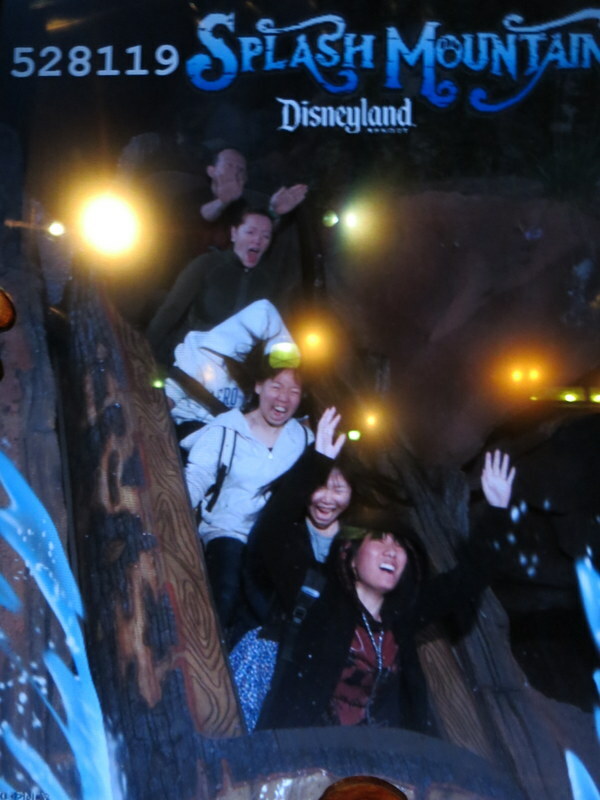 It was warm enough in case of getting too wet, but fortunately some young asian girls copped the brunt of the water, for which we thanked them immensely when the ride was done. 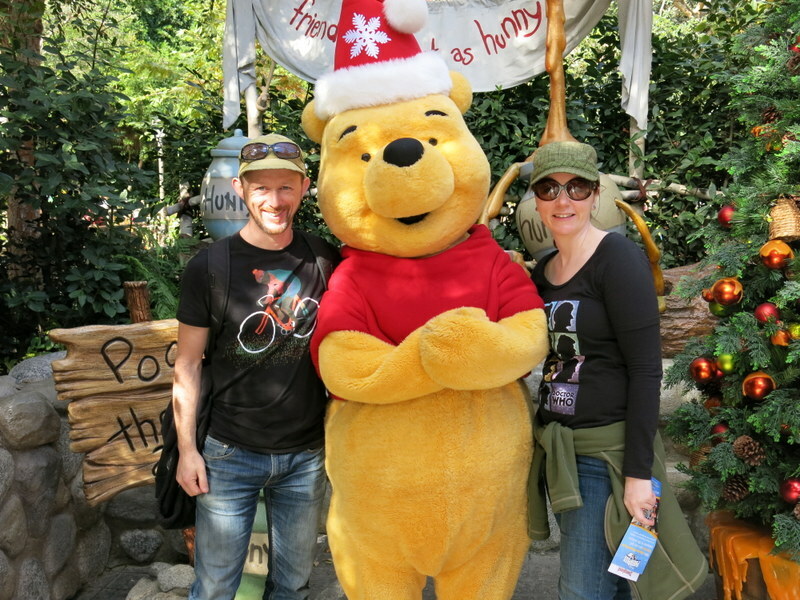 There was also a bunch of the storybook rides like Pooh, Pinocchio and the like that, while a bit lame for someone my age, are still kinda kitschy fun to go on. 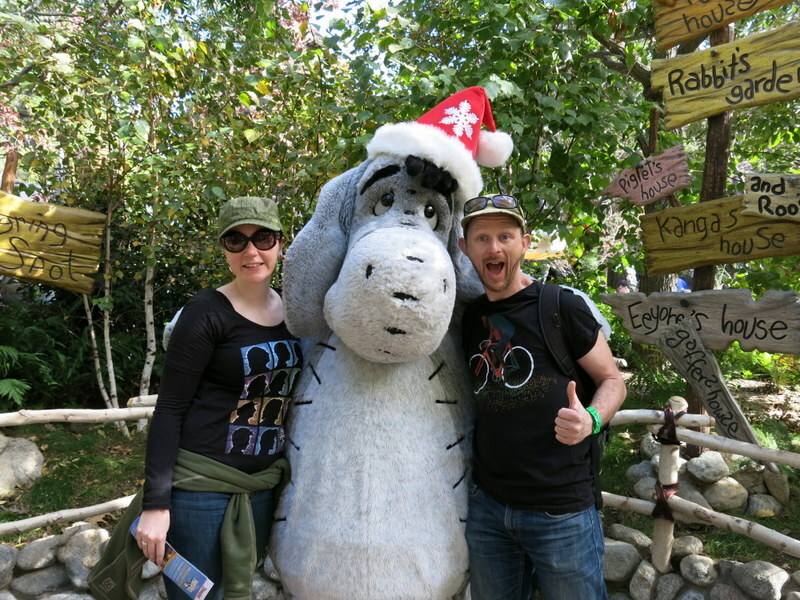 Pooh, Eeyore and co were about, so took the opportunity for photos. But this was mostly waiting for our fast pass time for Indy to arrive, which it did so on we jumped. To be honest I had much fonder memories of this than what I experienced going on it 15 years later. I remembered a crazy jeep ride with many more thrills and a great boulder chase. What it was, was a bumpy jeep ride with a fleeting appearance of the boulder and that was about it. Not disappointing, just a little let down. We were fast checking off all the rides. The Matterhorn awaited, but Kate wasn’t really interested, so I got some single rider quick action on to it. Boy howdy it was rough. This was definitely feeling its age. Also aged, but in a kinda still charming way is It’s A Small World, although this time of the year it was all Christmased up. What that meant is that by the end of the ride, rather than never wanting to hear the It’s A Small World song again, it was Jingle Bells. But, it is what it is, and you can’t really go to Disneyland without going on it. 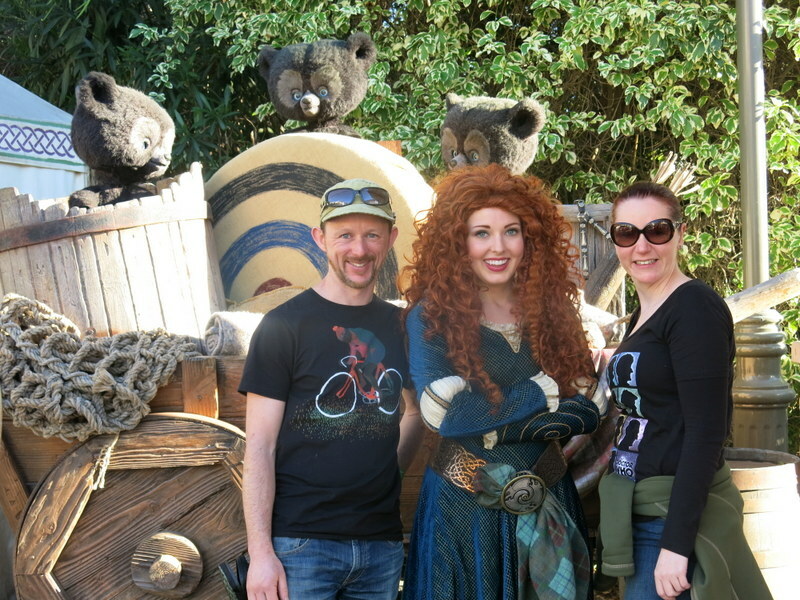 Just outside Small World we got to catch up with Merida from Brave, all red-headed and flowing locks. In the brief chit-chat of where we were from we managed to convince we have pet kangaroo… why not keep those stereo-types going huh? Well, she started it by asking us about Koalas. Anyway, the day was winding up for us as we had to get ready to go to our evening’s plans. On the way out we stopped by one of the stores to be party to quite an odd conversation between a visitor and a staff member. “Do you have any gifts for animals?” the visitor asked. The staff member seemed a little confused but in complete deadpan asked “For a dog or a cat?”. “A cat” came the reply, and the staff member then proceeded to come up with some gift ideas. I gotta say that about the Disney staff. Never once did I see one who would not do what they could to help out. 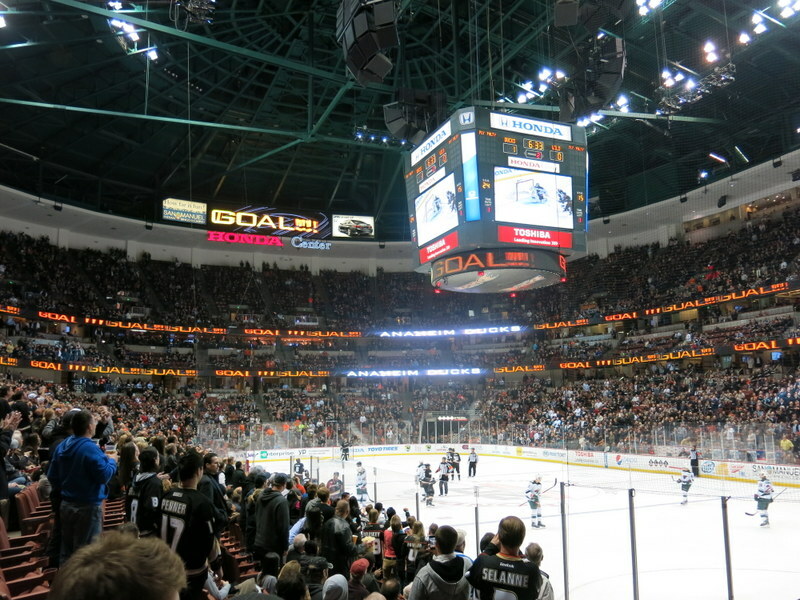 With that it was time to jump into a cab, not to go back to the hotel, but to the Ice Hockey! 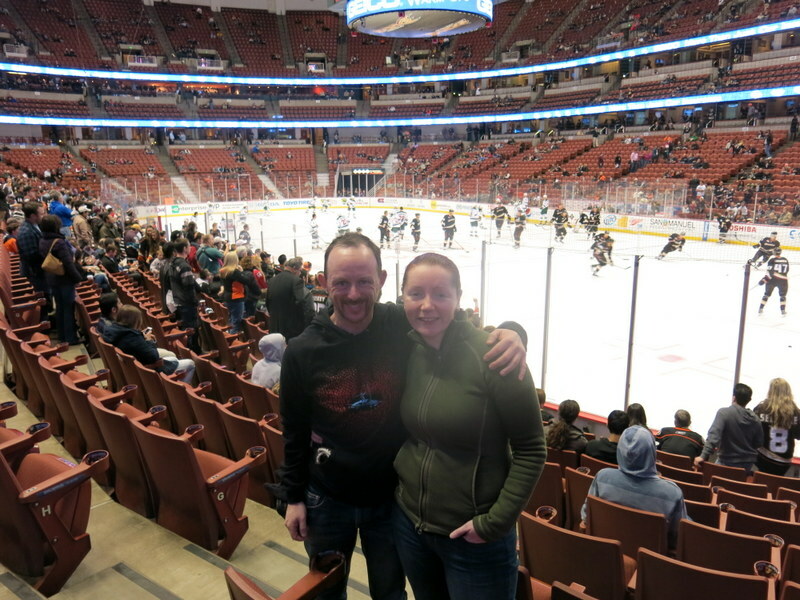 We had organised tickets sorted for the Anaheim Ducks v Minnesota Wild before we went and tonight was it. The stadium was nice and close and we were there early to slow down a bit and settle in for some bone-crunching hockey action. And bone-crunching it was. Slamming into the walls, pucks into the crowd. It was everything you wanted. After a slow first period, the second fired up with two great Ducks goals at our end. The final period was a nail biter with the Wild coming back, but the Ducks held on for a 2-1 win. Go Ducks! And with that it was back to the room to crash. A late one meant all we wanted was sleep… which we drifted off for given we had another early morning to come.